CHICAGO (AP) The Chicago Blackhawks agreed to contracts with free agents Chris Kunitz, Cam Ward and Brandon Manning on Sunday, addressing their depth in every position group after missing the playoffs for the first time in a decade. Kunitz got a one-year deal worth $1 million, and Ward’s one-year contract is for $3 million. Manning received a two-year deal. The 38-year-old Kunitz gives Chicago another experienced forward, Ward adds to the Blackhawks’ depth in goal after Corey Crawford missed most of last season, and Manning joins a mix of aging veterans and intriguing prospects on defense. Kunitz had 13 goals and 16 assists in 82 games with Tampa Bay last season. He also had an assist in 17 playoff games with the Lightning. The four-time Stanley Cup champion – with Anaheim in 2007 and Pittsburgh in 2009, 2016 and 2017 – also won gold with Canada at the 2014 Olympics. He joins a Chicago team looking for a comeback after finishing last in the Central Division. Crawford got hurt in December and the Blackhawks tumbled to 33 wins and 76 points, their lowest totals since they went 31-42-9 during the 2006-07 season. Upgrading its situation in net was one of Chicago’s top offseason priorities. Bowman said last month he expects Crawford ”to be back and ready to go in training camp,” and the goaltender is among the listed players who will attend Blackhawks Convention July 27-29, an annual event where current and former players meet fans and speak with reporters. Anton Forsberg was acquired in the Artemi Panarin trade with Columbus last June, but he struggled in his first year as Crawford’s backup and his status is up in the air with the addition of Ward. 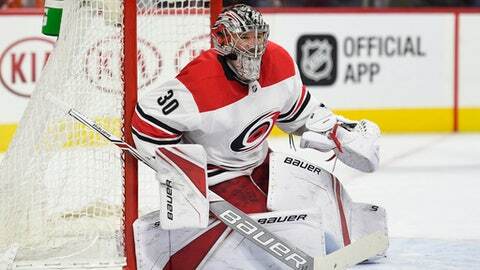 The 34-year-old Ward was selected by Carolina in the first round of the 2002 draft and spent his first 13 seasons with the Hurricanes. He went 23-14-4 last year with two shutouts, a 2.73 goals-against average and a .906 save percentage. Ward also has 41 career playoff appearances. He won the Conn Smythe Trophy in 2006 as playoff MVP when Carolina beat Edmonton for its only Stanley Cup title. Ward noted the Hurricanes did not contact him during the week leading to the start of free agency. The 28-year-old Manning set career highs with seven goals and 12 assists in 65 games last season with Philadelphia. He also played in six postseason games. Chicago also announced it had agreed to a three-year contract with defenseman Adam Boqvist. The Blackhawks selected the 17-year-old Boqvist with the eighth overall pick in this year’s draft.